Thank you Ian for the video link. This is some of the truth and some in that document is not true in my opinion, however overall purpose of that document is to induce fearful thinking which is the best weapon they have to make us fear them and everything the air that we breath even. This seems to be thought war indeed. aurora wrote: I didn't know if anyone else would find this odd. 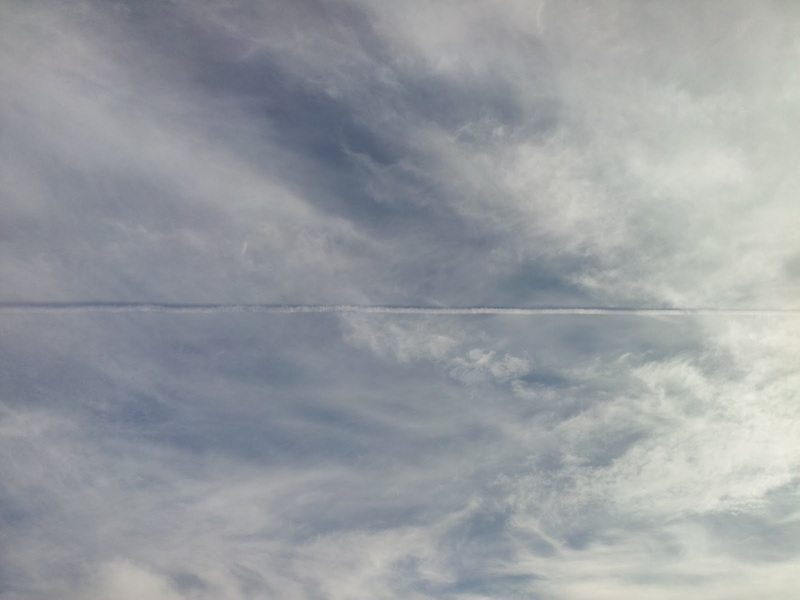 I got a picture of a plane that was leaving a chemtrail that had gone above or through a cloud. The chemtrail is white and yet where it overlaps with the cloud it is like there is a void. Maybe the chemtrail particles got more bigger in the "void" part and rained down with the rest of the moisture in the clouds leaving this opening in the cloud(s). sheri40380 wrote: I have seen that before, as well. When looking at it, it almost looked like a shadow, but the chemtrail itself wasn't there to make a shadow. 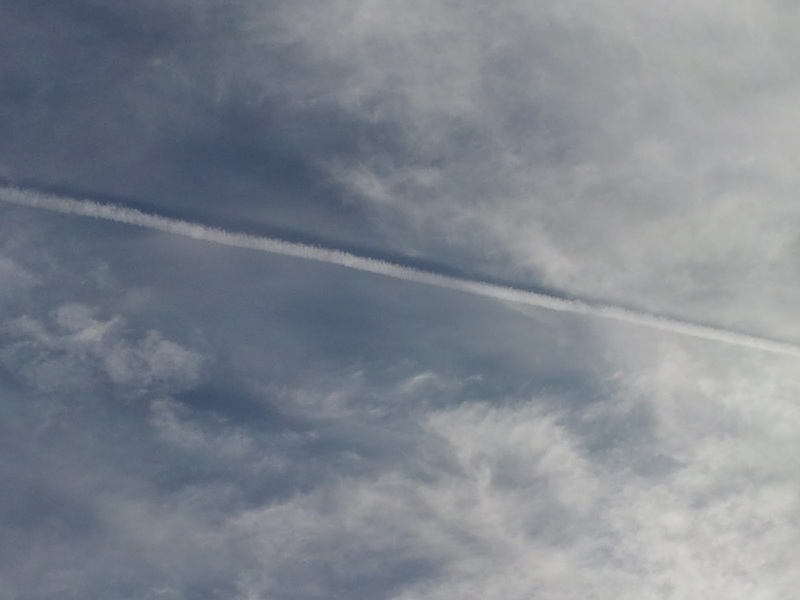 Could the chemicals be taking an immediate effect on clouds? If so, why does it look like a void? I'm not posing these questions in any particular direction - just stating that I've seen this in the recent weeks as well. May suggest that exhausted from jet engine very hot nano-particles (as they additives to jet fuel) appearing in high humidity environment (cloud) almost immediate fused into hydrates or similarities. Outside cloud those particles got cooled fast without chem reactions and keep staying then. Why is the shadow above? 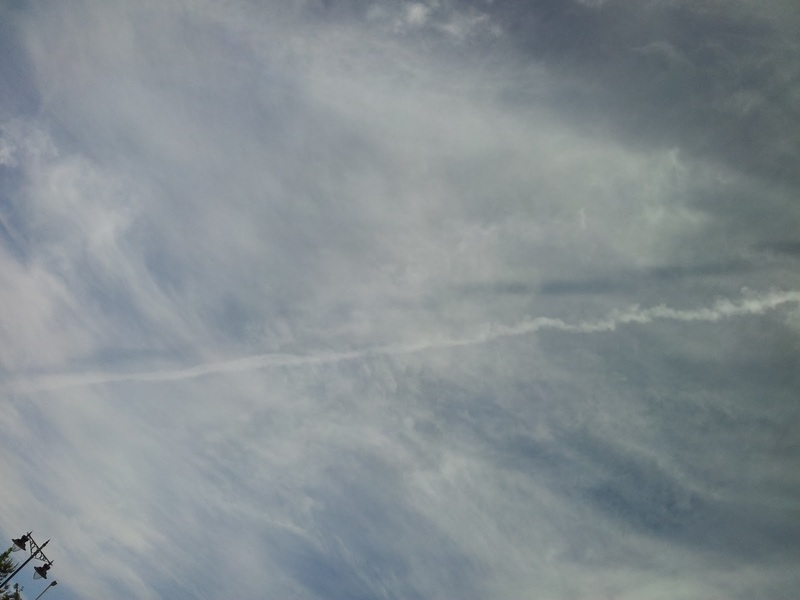 It definitely seems to be a shadow as it follows the curve of the dispersing chemtrail but why is it upside down?? Djchrismac wrote: Why is the shadow above? I think that since the plane has already gone through the cloud it has "collected" the clouds waterparticles in its path and sprayed them with the exhaust matter so that would explain that "shadow" and the reason why it is above is bacause of simple matter of gravity and the denseness of collected matter. This is just my explanation which is purely physical in nature. Yeah on studying it closer the first photo of the trail in the full sequence shows the shadow below it, suggesting that the plane flying through the chem-smear that is already there is causing the shadow/dark line and then the chemtrail spray above the engine wash is settling into the space and falling through it as gravity pulls it down and it begins to disperse. Like if you had a bubble bath and took the shampoo bottle along the surface to make a path while spraying the shampoo in your path through the bubbles behind you and watching it sink! It tells me that this video is "Private" and cannot be viewed. The "elites" have had a level of technology that has given them a real God complex. Being direct descendents of the Annunaki gods, they've always had the God complex. As for the "elites" making themselves immortal, ain't ever gonna happen. Immortality is not as difficult as one may think--if you are willing to pay the price. Man was engineered to live but 120 years. If you want to get rid of that limit, then you have to get rid of what makes you "man," remembering that Cro-Magnon is a hybrid. Daniel? Anybody? With just the effort that has been put into this to this point, it's going to take a superior technology and a LOT of ET help - out in the open, real help! I'm more than willing to fight, even at my age and with my damage, in order to save my country and the way of life I was raised to, but without some real help, it looks almost hopeless to me. Change does not require ANY technology, nor ANY "ET" assistance... all that is required is for the slaves to stop wanting to be slaves. And that's the crux of the issue. Nothing will happen until the peasants get fed up enough to pull out their pitchforks, round up all the kings, queens and royal families, presidents, congresses and politicos, transnational corporate officers and boards of directors, bankers, lawyers, spiritual channelers, gurus, priests, bishops and popes... stick them into the FEMA camps they built for us, and throw away the key. That's the path to world peace, as if you haven't noticed... it's these same people that have been creating world wars. If the point is to think for ourselves and not put up with the dictates of corrupt leaders, then viva la daniel. We just need to be careful not to stereotype all leadership as being corrupt. I don't believe this statement was intended to stereotype, but instead expresses the intense frustration with the current power structures, their methods, and their motives. To add to daniel's expression, the corrupted leaders, societal structures, and ways of thinking will have to be 'outed' through transition into systems that do work. For instance, all the work that daniel does to show an alternative to the current mass accepted history and accepted scientific understanding. The rest of us have a similar responsibility in the ways that we can contribute to change - by providing realistic alternatives. When people see something that works better and instead goes with that - then the current power structures will simply rot away. It is however essential that they do "go with the better way" instead of being stuck in their enslaving mentalities. Hi guys, long time lurker and this is my 1st post. Here are shots from my hometown, Montreal, Canada where I'm am temporarely before going back to (hopefully) Chemtrail-free Africa soon. The shot with the brownish tint look like reflections from the sun on the barium or strontium particles, what do you think? In any case, its almost a daily occurence with heavy rains after 3 or 4 days of accumulation. I just cant stand it anymore. With all the talk of the Cabal losing its grip, these schemes just seem to go on non-stop. When will it end? I'm confident the Sun will prevail and the light will achieve its aim but this geoengineering makes one wonder how effective is it in slowing or blocking our Logos energy? Is this the type of "sun goes dark" prelude we can expect when the sun evolves up to next level? or is this a different phenomena? Hi OM, from what I have read on Glimpses Into the Structure of the Sun by KVK Nehru the coronal holes are caused by high speed particles which is why they appear cooler despite it being a hole directly into the sun, the particles are moving so fast they are in time/space and not visible to us. I think it is quite likely that as the sun intensity increases that we will see more holes like this and it could well get to the point where the whole sun appears to shut down and go dark from where we are but it will actually be throwing out high speed particles all over and starting the next cycle of it's evolution before a core flare/expansion. Well that's my take on it anyway, you've made a good connection there I reckon! !